Posted by Kearsten Chapman on May 20, 2018 at 4:46 PM. Filed under LED Lighting, Around the Home, News . Using the included wireless remote, you can adjust the brightness and color with the touch of a button. Choose from traditional favorites like red, green and blue to compliment your favorite team colors on game day, to stunning shades and combinations of turquoise, pink, and purple to create your own unique ambiance. For traditional white light illumination, you can select from three white options: warm white (2200K), soft white (2700K) and daylight (5000K). For a vibrant color scheme, choices range from a single solid color, any two-color combination, and various preset color modes for holidays and special occasions, such as Fourth of July, Christmas, birthday parties and more. You can also set colors to slowly change into the next with built-in fade features or select strobe for a faster pace that brings your backyard to life. The remote also features 10-level dimming so you can customize the brightness, as well as two and four-hour countdown timers so you don’t have to remember to turn them off later. Enbrighten Seasons Landscape Lights keep outdoor spaces bright and colorful year-round using energy efficient lifetime guaranteed LED’s, so you never have to replace a bulb. They also feature commercial-grade, oil-rubbed bronze metal housing, which means these premium puck style lights are not only weatherproof but also UL-rated to withstand the toughest weather conditions to last a lifetime. Another thing you'll love is the versatility and easy installation options for gardens, backyards, flower beds, or walkways. The lights can be staked in the ground and positioned as spotlights, placed flush to the ground as path lights, or mounted facing down from railings and eaves using the designated keyhole slots. Each light set includes 22 feet of lead wire to reach any nearby outlet and an additional 10 feet of burial grade cable between each light so you can stretch them out or place them close together. The flexible cables between the lights can be buried below ground or simply covered with mulch or your favorite ground cover. With up to 150 lumens per light on the warm white setting, the bronze metal puck style lights are available in sets of 6, 9, and 12 light options. All three versions include a wireless remote that you can pair to control multiple sets of Enbrighten Seasons Color Changing Lights. 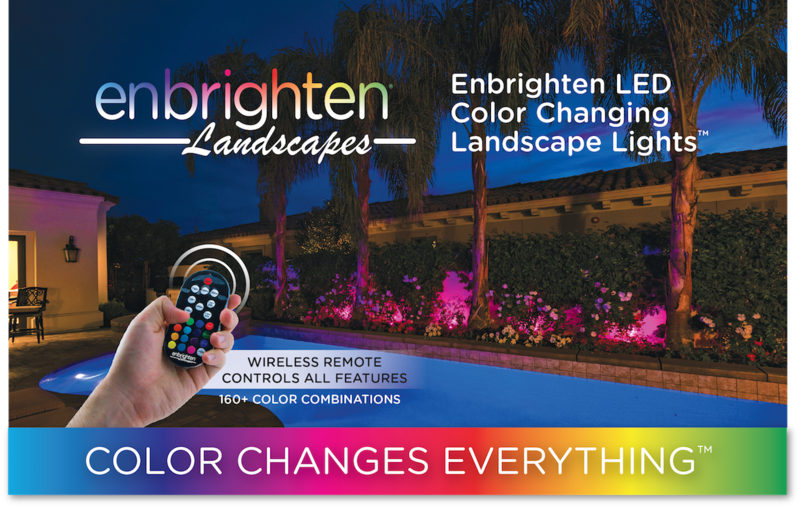 To learn more or to buy Enbrighten Seasons LED Color Changing Landscape Lights, visit enbrightenme.com or shop now below.